If you follow us on our Facebook page, you may have noticed that we have decided to discontinue-for some time- our departure to Sian Ka’an, given the state of the road. We took this decision because the road is really a mess and it’s no longer an excursion but a mission. We have had many meetings with the municipality of Tulum, but for the moment nothing is being done and the residents of Punta Allen cannot do anything, they are “hostages” stuck in the village. To try and find a solution this high season, we wanted to offer an alternative and especially to ensure that you are not running any risk. 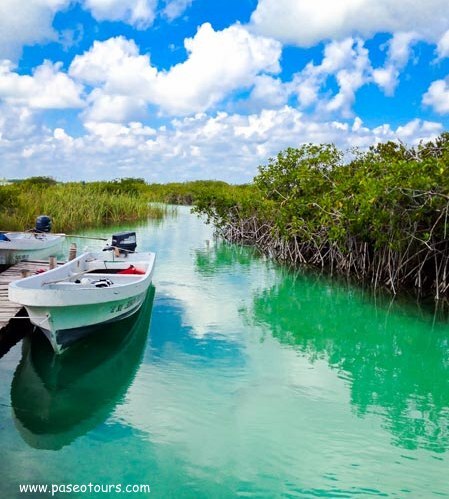 We therefore propose a new tour: Muyil & Boca Paila, which are both still in the Sian Ka’an Biosphere, but totally different from our trip to Sian ka’an. 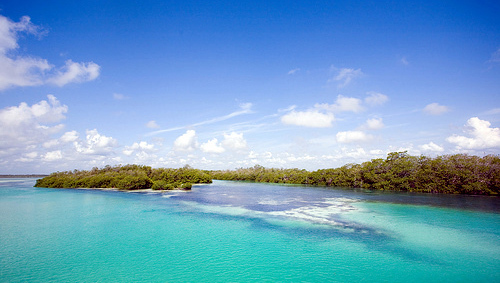 The Sian Ka’an Biosphere is one of the most beautiful places on the Caribbean coast. Its colors, its wildlife and wilderness are special attractions in our new tours ..
At Paseo Tours we try to stay one step ahead compared to all the other tourist offers that can be offered to you in the Riviera Maya. In Muyil & Boca Paila, we guarantee a change of scenery! A walk of four hours in the landscapes that you could only dream of. 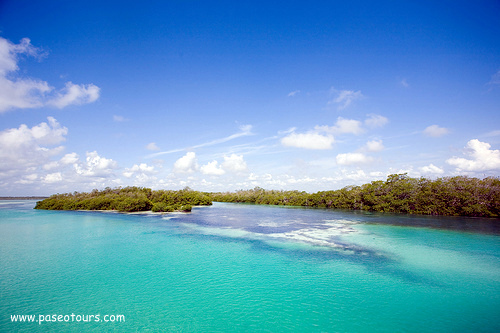 We begin by crossing the biosphere of Sian Ka’an, starting from a large fresh water lagoon to Muyil (about 20 minutes south of Tulum, so about a 1 hour and 20 minute drive from Playa del Carmen instead of 3 hours and 15 minutes). We then cross the canals surrounded by mangroves, clear water, turquoise, and finally we will stop next to a small Mayan temple in nature. This will be our starting point for an incredible adventure as we throw ourselves into the water to let us drift for about 900 meters by a natural stream in an old canal. 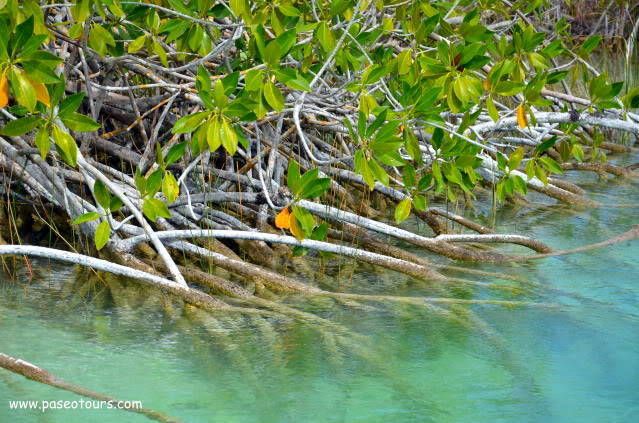 You will feel the mangrove under your feet, white and very fine sand, all in a translucent water with silence as your only companion-a truly unique experience. Following this incredible experience, we will take the boat and continue the tour through the mangroves to discover where the sea and the lagoon meet at the Boca Paila bridge. This is where you will see that the colors are stunning, and if Mother Nature allows it, we can perhaps see manatees and/or crocodiles.… Once there, we land on a deserted beach for seaside fun and swimming, before returning quietly to the village of Muyil. After this dose of breathtaking scenery, you can meet with the local people. We’ll take you to the town for traditional cuisine and where typical Mayan scenery is guaranteed! After all of these activities you can choose to spend time in the center of Tulum to do a bit of shopping or swim in THE best beach in the Mayan Riviera, and certainly one of the most beautiful in the world! The return back will be in the late afternoon. We propose the price for the day at around 75 € or 100 usd per person-all inclusive.